Authentic Italian cuisine accompanied by live classical music and Four Seasons’ impeccable service, beachside. 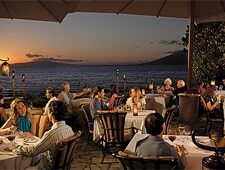 : The only truly beachside restaurant in Wailea, Ferraro's serves authentic Italian cuisine under a canopy of stars on the edge of Wailea Beach. Watch the glorious sunsets as canoe paddlers glide by in the water below. Listen to the Italian musical duo perform classical music and enjoy Four Seasons service, orchestrated to perfection. The ambience is a perfect complement to the cuisine. The restaurant features a nightly risotto, and other favorites include grilled veal chop with sage and gnocchi tossed with fontina fondue. The wine list is a map of Italy with regions highlighted and suggested food pairings. At meal's end, savor la mezza luna: a trio of apricot, coconut and black-currant sorbet with coconut crisp.